OSHA requires that every employer make safety and health a top priority and ensure a safe working environment. OSHA's job is to provide leadership and encouragement to employers to take that responsibility seriously. They do this through enforcement of regulations as well as educational programs for employers to help them navigate the rules and awareness opportunities for employees so they know of their rights to a safe workplace. Employers have a duty to protect workers from injury and illness on the job by developing and implementing a safety and health program that includes safety training and optimally, regularly scheduled safety meetings or toolbox talks. Question: How long does my company need to keep safety meeting sign-in sheets and safety training records? Short Answer: OSHA doesn’t say. Unfortunately, OSHA does not provide a simple guideline that would apply to all training records. But of course, it couldn’t be easy, could it? Better Answer: To ensure your company is holding onto training records for the required length of time, review the specific standards that the training may fall under and make sure your recordkeeping policy is at least as strict as the standard. Bloodborne Pathogens 1910.1030(h)(2)(ii) Training records shall be maintained for 3 years from the date on which the training occurred. Manlifts, Powered Platforms for Building Maintenance 1910.66(i)(1)(v) The employer shall certify that employees have been trained in operating and inspecting a working platform by preparing a certification record… The certification record shall be prepared at the completion of the training… and shall be maintained in a file for the duration of the employee’s employment. Mechanical Power Presses 1910.217(h)(13)(ii) The employer shall certify that employees have been trained… The certification record shall be prepared at the completion of training and shall be maintained on file for the duration of the employee’s employment. Methylenedianiline 1926.60(o)(6) The employer shall maintain all employee training records for one (1) year beyond the last date of employment. Most OSHA standards that required employee training do not specify the length of time that the training records need to be kept. For example, Fall Protection and Lockout/Tagout training is required, but the standard just says the training must be documented and kept up-to-date. This implies that the training records should at least be maintained for the duration of the employee’s employment. Fall Protection 1926.503(b)(2) The latest training certification shall be maintained. As you can see, even with these examples above, the requirements are all over the place and there is no clear overall requirement for all training records. Also, keep in mind, there is no specific requirement for how long any company must keep safety meeting and toolbox talk sign-in sheets. 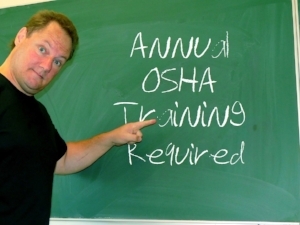 For more information, here’s a great article on OSHA Safety Meeting Requirements. SHRM has a comprehensive article on recommended document retention periods based on OSHA standards and documents that could be useful if you’d like to take a closer look: Know OSHA’s Document Creation, Retention Requirements. To make things less complicated, here are some recommendations on safety training records retention. Keep all training records, including safety meeting sign-in sheets, at least for the duration of time that the employee is still working at the company PLUS three years. Here’s the reason why: Employees, even former employees that just left the company or had their employment terminated, could file an OSHA complaint. 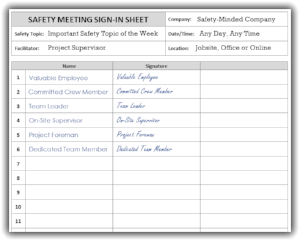 If the complaint has to do with safety training, then you may need those weekly safety meeting sign-in sheets to prove to OSHA that you are in compliance with training requirements. If your organization has any other records retention policies that are stricter than those in your applicable OSHA standards, then you could consider just making that same policy apply to all documents including training related records. For example, your company may adopt a policy to keep all records for 10 years. If you are set up with electronic records or have a way to scan and upload the training records and sign-in sheets then you could just keep the files indefinitely. A lot of organizations are going this route. With automatic backup and archival of the files, this may be the safest way to make sure you can show any regulator that you are making your best efforts to stay in compliance. To find out more about the training requirements that may be applicable to your company, OSHA has put together a publication that you can search through easier than the online standards. Open up or download the PDF version of Training Requirements in OSHA Standards, and then you can search by typing CTRL-F on the screen. CTRL-F will open up a FIND box at the top of the document so you can search any terms like training, records, PPE, fall protection, lockout/tagout, etc. that will help you start to gather more definitive details on your training and record-keeping requirements. For more ideas on preparing for and holding safety meetings check out 4 Simple Steps to Effective Safety Meetings and don’t forget to browse the Weeklysafety.com blog for other excellent articles on improving your safety program. To learn more about why OSHA believes safety meetings are a vital component of safety and health programs visit: Q & A’s for Small Business Employers.